The Nord Stream Gas Pipeline (NSGP) project is operated by Nord Stream AG. It is a joint venture in which Gazprom holds a 51% stake, BASF / Wintershall and E.ON Ruhrgas have 15.5% each and NV Nederlandse Gasunie and GDF Suez hold nine percent each. Europe requires more than 100 billion cubic metres (bcm) of natural gas each year. Part of this requirement is supplied through the 1,224km-long NSGP (formerly North European Gas Pipeline). It exports natural gas from Yuzhno-Russkoye oil and gas deposits within the Leningrad region of Russia to Germany. The project consists of a twin-pipeline with a combined capacity of 55bcm a year. Construction on the first pipeline commenced in April 2010 and was completed in June 2011. Construction of the second line began in May 2011 and was completed in April 2012. The first pipeline, which has a capacity to transmit around 27.5bcm of gas, started transporting natural gas from Russia to Germany in November 2011. The second line, with a transmission capacity of 27.5bcm, commenced operations in October 2012. Commercial gas deliveries began in November 2012. "The project consists of a twin-pipeline with a combined capacity of 55bcm a year." The contract for laying the pipelines was awarded to Saipem in June 2008. The contract was valued at more than €1bn. Three pipe laying vessels were employed for the purpose. The Yuzhno-Russkoye field contributes the bulk of gas supplied through the NSGP. Additional gas is procured from reserves in the Yamal Peninsula, Ob-Taz Bay and Shtokmanovskoye. The license for the exploration and development of the Yuzhno-Russkoye oil reserve was given to OAO Severnefte Gazprom, a 100% subsidiary of OAO Gazprom. A €35m contract to frame four tie-ins over the two parallel pipelines was awarded to Technip in March 2010. The NSGP project enables Gazprom, for which Germany is the largest export market, to become one of the major gas producers in the world. The new project also strengthens Gazprom’s position as a major supplier in Germany and Western Europe. The preliminary front end engineering and design was completed by Intecsea Engineering in 2008. The project first began in 1997 when Gazprom and Finnish company Neste (later known as Fortum) formed a joint company, North Transgas Oy, for the construction and operation of a gas pipeline from Russia to northern Germany across the Baltic Sea. The German partner for the project was Ruhrgas (later E.ON). In April 2001, Gazprom, Fortum, Ruhrgas and Wintershall commissioned a joint feasibility study for the pipeline. In November 2002, the management committee of Gazprom approved a schedule of project implementation. In May 2005, Fortum withdrew and sold its 50% stake in the project to Gazprom. As a result, Gazprom became the 100% owner of North Transgas Oy. In September 2005, Gazprom, BASF and E.ON signed a basic agreement for the construction of a North European Gas Pipeline. In November 2005, the North European Gas Pipeline Company (later Nord Stream) was incorporated in Zug, Switzerland. In December 2005, Gazprom began construction of the Russian onshore section of the pipeline. In October 2006, the pipeline and the operating company were officially renamed Nord Stream. The onshore section of NSGP in Russia is nearly 917km long. The remainder is a marine gas pipeline which lies under the Baltic Sea, from Portovaya Bay (Vyborg) to the coast of Germany (at Greiswald). Marine gas pipelines were used for gas supplies to countries including the UK, Finland and Sweden. "It exports natural gas from Yuzhno-Russkoye oil and gas deposits within the Leningrad region of Russia to Germany." The Yuzhno-Russkoye field has estimated gas reserves of more than one trillion cubic metres, including 700bcm of proven reserves. The field was developed at an estimated cost of €1bn. NSGP is also fed with additional gas supplies from fields in Yamal Peninsula, Ob-Taz Bay and Shtokmanovskoye. Initially, the gas transportation began through the first pipeline with a capacity of 27.5bcm a year. Commissioning of second pipeline takes the NSGP’s combined gas supply capacity to 55bcm a year. Each pipeline is 1,224km long. With Gazprom starting the construction works, the first 100km of gas pipeline on the Leningrad region were laid by mid-2006. The diameter of the pipe is 1,220mm (48in), the wall thickness 38mm and the working pressure 220bar. There is a service platform in the Swedish economic zone, 90km to the north-east of Gotland island. The size of the platform is 30m x 30m and it stands approximately 35m above sea. The platform is used for maintenance and service of the pipelines, including launch and reception of testing and diagnostic equipment, control of gas parameters and placement of isolation equipment (valves). WINGAS, a natural gas trading company, supplies gas for consumers in Germany and Western Europe. It is a joint venture between Wintershall, a wholly owned subsidiary of BASF, and the Russian company OAO Gazprom. Wintershall holds a 65% stake in the joint venture and OAO Gazprom holds the rest. WINGAS has formed an alliance with OAO Gazexport for procuring gas from Russia. Through NSGP, WINGAS will procure nine billion cubic metres of natural gas a year for a period of 25 years. 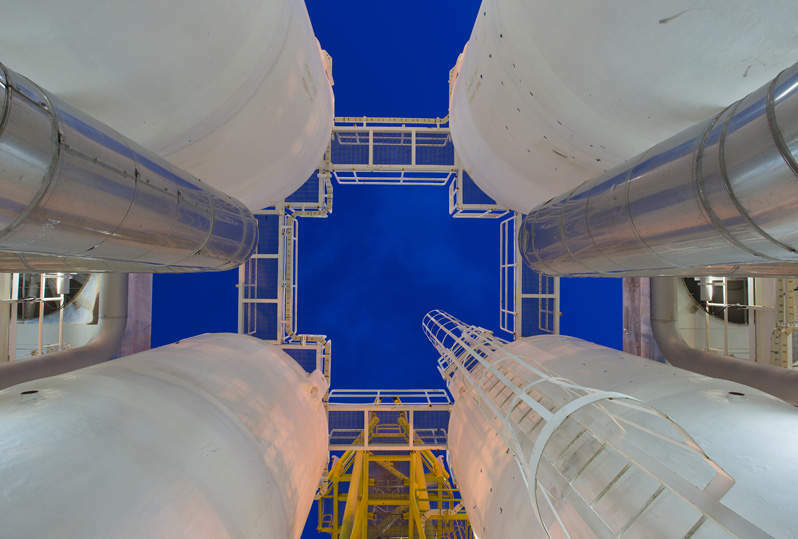 The WINGAS and E.ON Ruhrgas pipeline systems in Germany supply gas from NSGP to E.ON and BASF. The Russian onshore section of the NSGP began construction in December 2005 in the town of Babayevo (Vologda Oblast) and was completed in 2010. The section stretches from Gryazovets to the coastal compressor station at Vyborg in the Leningrad region. The length is 917km, the diameter of the pipe is 1,420mm and working pressure is 10MPa, which is secured by six compressor stations (the transportation capacity of gas pipeline is 27.5bcm). The Russian section of the pipeline also supplies gas to the northwestern region of Russia (St Petersburg and Leningrad Oblast). It was constructed and is being operated by Gazprom. According to the Finnish natural gas company Gasum, a branch pipeline in Karelia connects the onshore section of the pipeline to Finland. The offshore section of the NSGP runs from the Vyborg compressor station at Portovaya Bay below the Baltic Sea to Greifswald in Germany, with a total length of 1,196km. More than 22km run inside Russian territorial waters, 96km in the Russian economic zone, 369km in the Finnish economic zone, 482km in the Swedish economic zone, 37km in the Danish economic zone, 112km in the zone disputed between Poland and Denmark, 33km in the German economic zone and 33km within German territorial waters. "The Yuzhno-Russkoye field has estimated gas reserves of more than one trillion cubic metres." The Western European part of the Nord Stream pipeline project includes two transmission pipelines in Germany. The southern (OPAL pipeline) stretches from Greifswald to Olbernhau near the German-Czech border. It is tied to Nord Stream with JAGAL (connected to the Yamal-Europe pipeline) and STEGAL (connected to the Russian gas transport route via Czech and Slovak republic) pipelines. The western pipeline (NEL pipeline) runs from Greifswald to Achim, where it was connected with the Rehden-Hamburg gas pipeline. In conjunction with the MIDAL pipeline it created Greifswald-Bunde connection. Further gas delivery to the UK is made through the connection between Bunde and Den Helder, and from there through the offshore interconnector Balgzand – Bacton (BBL Pipeline). By passing Poland, Lithuania, Estonia, Belarus and Ukraine, the NSGP project provides a new channel for Russian natural gas exports to Europe and minimises the sovereign risk involved in cross-border projects. The project also reduces the cost of transportation. The Scandinavian countries get gas through the NSGP project, which also ensures a reliable gas supply to Western Europe, north-west Russia and the Kaliningrad exclave. In addition, the new Gryazovets-Vyborg pipeline – via Vologda and Leningrad regions – connects the NSGP with the Russia’s United Gas Transmission system to cater for gas demand in the St Petersburg and Leningrad regions. 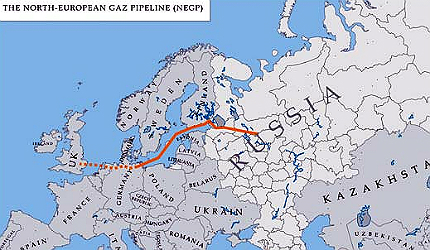 North European Gas Pipeline (NEL) is a 440km pipeline which forms part of the larger Western European section of the Nord Stream Gas Pipeline (NSGP) in Germany. South Caucasus Pipeline (SCP) is a gas exportation pipeline that transmits natural gas from the Shah Deniz field located in the Azeri Caspian Sea to Azerbaijan, Georgia and Turkey for distribution.